Migration and integration are linked to depleted support networks. Although social support is a key determinant of health, newcomers’ appraisal of social support and its impact on health have not been adequately studied. This investigation focused on immigrants’ and refugees’ views of social support, its perceived influence on health and the use of health-related services. Individual in-depth interviews were conducted with 60 Chinese immigrants and 60 Somali refugees in Canada. The study revealed many stressful situations, including health problems that signified a need for support. Just as inadequateand inappropriate support has a negative impact on health, poor health can diminish available support. Social support facilitated employment and ability to meet basic needs, reduced stress, and improved physical and mental health. Support from others reduced loneliness and despair and enhanced the mental health of newcomers. Newcomers believedthat inadequate support exerted a negative influence on their health and use of health-related services, and that poor health had a detrimental effect on the ability to seek or offer support. • Newcomers (i.e. immigrants and refugees) experience numerous settlement and integration challenges, including health problems, which increase their support needs. • Newcomers experience social support deficiencies in their countries of settlement. • Cultures differ in the way that they define, receive and give support. • It examines newcomers’ perceptions of social support and its impact on health and use of services as influenced by their cultures. • It describes a comparative analysis of support appraisal across two different cultures and newcomer groups (i.e. immigrants and refugees) and how their cultures influence support-seeking strategies. • It considers the contextual nature of support expectations and perceptions among newcomer groups as they interact with their host environments/communities. International migration has increased in the past two decades (United Nations High Commissioner for Refugees, 2004). Canada has admitted between 28 000 refugees and 235 215 immigrants annually (Citizenship and Immigration Canada, 2009). As a result of immigration, 18% of Canada’s current population was born in another country; 70% of new Canadians are considered to be members of visible minorities (Statistics Canada, 2005). Emerging evidence points to the settlement and integration challenges experienced by newcomers, including social support deficiencies and health problems (Simich et al, 2003; Stewart et al, 2008). Despite contextual variations, such as immigration policies, immigrants and refugees have faced similar challenges with resettlement for the past five decades (Beiser, 1988; Balgopal, 2000). Newcomers experience many barriers to support, intensified by government cutbacks which inhibit social and health service provision (Gagnon, 2002). The interaction between social support and health is bi-directional (cf. Stewart, 2000; Krause and Wulff, 2005). Support enhances well-being and reduces or buffers the adverse psychological effects of exposure to stressful life events. Conversely, good health can facilitate supportive and/or reciprocal relationships (Stewart, 2000). Sources and appraisal of support differ across cultures (Leduc and Proulx, 2004), and there are persistent gaps in research on support appraisal for newcomers (McDonald and Kennedy, 2004). Moreover, the role of social support and its effects on health have not been investigated from the perspectives of immigrants and refugees. Given the influence of social support on health, and the social and systemic barriers to support for newcomers, we investigated how immigrants and refugees perceive social support and its effects on health and the use of health-related services. The disruption to family and cultural ties that is associated with migration contributes to the extensive support needs of immigrants and refugees (Hernandez- Plaza et al, 2004). Newcomers face particular struggles in obtaining social support in their host countries, intensifying problems with integration (Wu and Schimmele, 2004). Social relationships that provide meaning in the natal environment may be either disrupted or devalued in the receiving country (Warner, 2007).While there are different reasons for migration, which include making a personal choice to migrate and being forced to do so, the process of acculturation in the new country is linked to numerous challenges. These include problemswith language,finances (Warner, 2007; Stewart et al, 2008), housing, childcare, and access to services, which have been noted previously among refugees from Eastern Europe (Stein, 1981; Gerrand, 1988) and more recently among refugees from Africa, Asia and Latin America (Davis, 2000). Refugees also experience deteriorated physical, mental and cognitive health (Beiser, 1988; Davis, 2000). For newcomers, social support is a key determinant of health (Warner, 2007; Nicdao et al, 2008) and use of health services (Abe-Kim et al, 2007). Social support is a resource for coping with stress caused by immigration and resettlement challenges. Support provided by community members of similar ethnicity is associated with positive health outcomes, whereas lack of social support has a detrimental effect on mental health (Palinkas et al, 2003; Nicdao et al, 2008). Separation from family exacerbates the severity of psychological problems (Rousseau et al, 2001). Newcomerswith extensive social support are more likely to access professional services (Alegria et al, 2004). However, ethnic groups differ in their attitudes toward the health system, and may mistrust health professionals (Davies and Bath, 2001). Despite emerging evidence pointing to the influence of social support on the health of newcomers, health-related challenges that require social support and mechanisms by which support influences health and the use of health services have not been investigated (Leduc and Proulx, 2004) from the perspective of immigrants and refugees. In this study, key dimensions of social support, namely source, function, appraisal of positive and negative features (Stewart, 2000), use of support seeking as a coping strategy (Thoits, 1995), and perceived impact on health (Bloom, 1990), were assessed. The perceived links between social support and health, health behaviour and use of health services are emphasised in this paper. Comparison of less established refugees with more established immigrants enabled examination of the influence of support resources in the host community on health and the use of health-related services. Comparison of the two newcomer groups is warranted as, unlike other migrants, refugees are unable or unwilling to return to their homeland, have lower annual earnings (Cortes, 2004) and fewer social networks, and cannot access certain services (Davis, 2000; Stewart et al, 2008). The top five source countries of immigrants in Canada at the time when the study was conducted included China. We selected Chinese immigrants because of their long history in Canada and their strong community infrastructure of support services (Griffin, 1993). Given our limited access to refugee claimants (asylum seekers), we focused on Convention refugees. These refugees are accepted by Canada for permanent residence either before or after arrival in Canada as persons in need of protection and resettlement because of a well-founded fear of persecution according to the definitions in the United Nations 1951 Geneva Convention. In recent years, Somalia was one of the top 10 source countries of refugees in Canada (Citizenship and Immigration Canada, 2007). Five research questions guided this study. 1 What stressful situations that are faced by newcomers require social support? 2 What are newcomers’ perceptions and experiences of social support? 3 How does social support influence newcomers’ health? 4 How does social support influence newcomers’ use of health and health-related services? 5 What support services and programmes can enhance newcomers’ lives? The interdisciplinary team of investigators represented diverse fields, namely anthropology, epidemiology, nursing, medicine, psychiatry and sociology. The research design was based, in part, on critical social theory to attend to unheard voices, such as vulnerable populations, and interpret participants’ experiences within the context of broader social relationships (Morse and Chung, 2003). Critical social theory was invoked because relocation and integration experiences are situated within a complex context of cultural, political and economic circumstances that can mediate the personal and social experiences of immigration and resettlement. The study sought an emic understanding of meanings that newcomers attach to social support. In-depth semi-structured interviews were used to gather descriptions of the reality of newcomers’ perceptions and experiences (Hammersley and Atkinson, 1995; Nastasi and Schensul, 2005). These interviews were supplemented with census data, field notes, and settlement service reports to provide comprehensive information about newcomers’ perceptions and experiences of social support, implications for their health and the use of health and health-related services. Ethical approval for the study was obtained from the appropriate university committees in all three provinces. The participants received information about the study and consent forms that had been translated into their preferred language, and gave permission to have their confidential interviews audiotaped. Interviews lasted on average one and a half hours. The participants were given an honorarium of $20 each, and $20 for childcare. • What does ‘health’ mean to you? • How is your health affected when you do not get the support you expect? The guide was pilot tested with two participants from each ethnic group at each site (n = 12). In an iterative process akin to respondent validation, the pilot test results were shared with site community advisory committees that guided modifications of the interview guide (Rich and Ginsburg, 1999). An inductive form of data analysis driven by theory and research questions was used to identify categories, concepts and themes in interviews (Nastasi and Schensul, 2005). Research assistants drawn from each ethnic and geographic community translated and transcribed recorded interviews, which were then subjected to content analysis using a category system of key concepts and themes. The categories were identified by inductive analytical processes, moving from participants’ particular experiences to general categories. These categories met the following criteria: inclusive, useful, mutually exclusive, clear and specific (Creswell, 2003). The selected categories were included in a common coding framework, which was jointly developed by investigators and research assistants at all sites. The Non-Numerical Unstructured Data Indexing Searching and Theorizing (NUD*IST) software package was used to facilitate qualitative datamanagement (Richards and Richards, 2002). Using the same initial transcripts across sites, inter-rater agreement by three independent coders was assessed until it reached 80%, to increase consistency and promote comparative analysis of data (Rich and Ginsburg, 1999). Following the comprehensive coding process, thematic and ethnographic analyses were applied to qualitative data in order to classify common themes within the framework into larger clusters (Creswell, 2003). Direct quotations from informants were used to enrich the accuracy and relevance of descriptions. Rigour was achieved through data saturation, theoretical sampling, identification and analysis of negative cases, audit trail, methods triangulation, inter-rater reliability, and reflexivity (Lather, 1991; Hammersley and Atkinson, 1995). Table 2 :Interview guide for Chinese immigrants and Somali refugees. The study was conducted in three provinces in Canada. Three majormetropolitan regions of Canada, namely Toronto (population 4 682 897), Vancouver (population 986 965) and Edmonton (population 937 845), were selected because of a concentration of immigrants and refugees in these cities (Statistics Canada, 2005). Criteria for choosing the newcomer groups included length of establishment and barriers to health and social services during settlement and integration. Although sample sizes in qualitative research are often small, the large sample size in this study (n = 120) enabled a comparative examination of different settings and varied socio-demographic characteristics (Sandelowski, 1995) (see Table 1). Agencies that serve immigrants and refugees facilitated the recruitment process. Inclusion criteria limited participants to adults who had been living in Canada for less than nine years, as research suggests that a period of ten years is required for economic integration (Stein, 1981; DeVoretz, 1995). 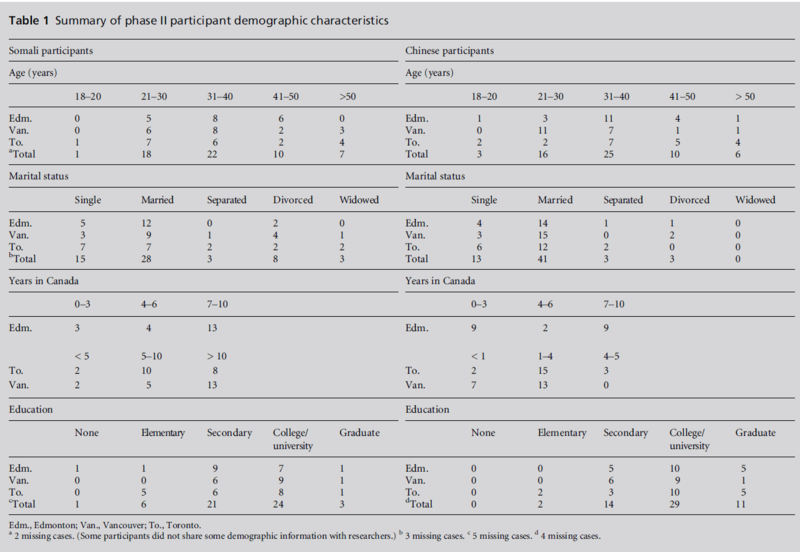 Using a purposeful sampling strategy (Malterud, 2001; Creswell, 2003), we ensured diversity with regard to age, level of education, region of origin within homelands, number of years in Canada, gender and marital status. A demographic data form elicited information on factors such as employment and living arrangements, which were relevant to social support experienced by newcomers (see Table 1). Purposive sampling was combined with network or snowball sampling (Davis, 2000; Creswell, 2003). The participants referred researchers to other members of their social network, who were assessed for inclusion to ensure a varied mix of social demographics and promote transferability of findings (Malterud, 2001). Recruitment from the target ethnic communities was facilitated by site advisory committees consisting of members of newcomer and ethno-specific community agencies. Research assistants drawn fromeach of the twocommunities were able to reassure potential participants. These approaches minimised recruitment problems, and there were no refusals. The participants reported mental and physical health problems and inadequate healthcare coverage for medications, supplies or supplementary health services. When they or their children experienced health problems, they had difficulty in focusing on settlement challenges. They argued that the barriers which they experienced during migration and settlement increased their levels of stress and ill health. Lack of employment had a detrimental effect on their mental and physical health, and having to cope with financial constraints increased their anxiety. Some of the participants maintained that they could not risk becoming ill because they could not afford services that were not covered by government. Some of them worked in jobs without extended health benefits, and could not take time to seek physician services. Family separation was linked to loneliness, anxiety and distress, particularly for Somali refugees. The participants identified four types of social support, namely information (e.g. advice, suggestions, directives), practical/instrumental support (e.g. aid, money, labour, aid in kind), emotional support (e.g. listening, understanding, sympathy, empathy, caring, sharing feelings) and affirmation (e.g. appraisal, feedback, social comparison). They defined social support broadly as encompassing both informal (i.e. family members, friends, neighbours) and formal (i.e. government, organisations) supports. Helpful support was associated with peace of mind, alleviation of stress, and a reduction in isolation and loneliness, whereas unhelpful support was attributed to systemic barriers such as eligibility restrictions to services. The Chinese participants indicated that support in their homeland was available throughout the lifespan, first from school friends and then from work colleagues. These social networks diminished when they came to Canada. Most of the Chinese participants indicated that they had no expectations about (formal) support when they arrived, as it was lacking in their home countries. Following arrival in Canada they had to depend on the formal service system, which many described as under-resourced. Somalis refugees described a shift in patterns of support. In Somalia, younger people were normally supported by their families. In Canada, they supported themselves, as well as their parents and relatives in their homeland. Many newcomers built strong relationships with family members as a source of encouragement in times of difficulty. Most of the Chinese and Somali participants agreed that the provision of social support helped them to overcome obstacles in the immigration process, and to adapt to the new social environment. Religious institutions and community centres provided a sense of community and support for newcomers. Some of the participants viewed service providers from the same background as the most helpful source of support, because they had lived in Canada for some time, had learned about Canadian culture and customs, and so could help in the settlement process. During the initial stage of immigration, most of the participants were primarily concerned with survival needs. The Somali refugees arrived in Canada with fewer financial resources, and so faced more pressing needs for basic support such as food and housing, than Chinese immigrants. Over time, with basic survival needs met, language skills mastered and jobs secured, newcomers began to seek support to facilitate longterm settlement. Although help with initial settlement was important, some participants believed that support should also enable newcomers to achieve wellbeing and integration in Canadian society. Just as inadequate social support had a negative effect on health, poor health could have a detrimental influence on support. Newcomers who were unhealthy could not support others. Chronic illness was linked to dwindling support, and inadequate support in turn escalated other health problems. Refugees reported challenges related to access to health services and unmet support needs. Barriers stemmed from a three-month waiting period that was imposed prior to processing landed immigration status, inadequate coverage by the Interim Federal Health Program, language difficulties, social isolation, bureaucratic processes, perceived racism, and negative attitudes of staff. Immigrants and refugees suggested services, programmes and policies in health and social sectors that could fulfil their support needs. These newcomers recommended that health and social agencies should communicate their policies and services to the public, play a bridging role between them and the government, advocate policy-level changes pertaining to culturally appropriate support, address their challenges, and help them to navigate the health and social systems. They suggested that professionals should participate in cultural sensitivity workshops, and they wanted information about health and health-related services and support to be available in English and in their native language. To increase accessibility to and use of health and social services, the participants wanted long-term coordinated supports, interpreters or multilingual service providers, and information about available resources and benefits. Table 3 summarises the key findings, highlighting the similarities and differences between Chinese immigrants’ and Somali refugees’ perceptions and experiences. In this study, the participants’ perceptions of social support depended on experiences in their homeland, their cultural and religious heritage, and assumptions about supportive acts and expressions of support. Social networks were diminished and dislocated during immigration and resettlement. These newcomers perceived that interactions between social support and ethnicity influence health. Strategies that foster expansion of newcomers’ social networks can enhance their health and use of health and social services. Table 3:Similarities and differences between Somali and Chinese perceptions and experiences. The under-use of services and supports that were not considered to be linguistically and culturally relevant, which was observed in our study, indicated that newcomers are active agents in seeking support, and that their perceptions of social support and helpseeking strategies were influenced by their cultural backgrounds. Although meanings and sources of support differ between Chinese and Somalis, they also evolve in social interactions with the host community. Indeed, culture provides a contextual ground for soliciting, providing and receiving social support (Owens and Randhawa, 2004). However, our study also revealed that newcomers’ expectations and perceptions of support changed as they interacted with the host community, and that support services vary according to the home country. The participants’ views reflect the assertion that social support is a resource for coping with stress linked to immigration and resettlement challenges (Palinkas et al, 2003). The participants shared varied conceptualisations of health consistent with the World Health Organization’s holistic definition encompassing mental, physical, spiritual and social well-being (World Health Organization, 1998). The picture painted by these newcomers reflected synergistic interactions between physical, mental and psychosocial health. To most Somali participants, mental health incorporated spiritual well-being. For them and for the Chinese participants, health incorporated social determinants of health, such as income, employment and social support. Social–ecological models give primacy to social structures as determinants of health status (Raphael, 2004). While some newcomers emphasised social (e.g. social networks) and personal (e.g. skills, qualifications, language) resources, others noted the importance of physical capabilities (e.g. ability to work) in their definitions of health. These newcomers described pathways through which social support influenced physical, mental, spiritual and psychosocial health. They emphasised the significant effect of social networks on health outcomes. Other studies point to the importance of social networks and social support for health and health services utilisation among Latino and Asian immigrants in the USA (Alegria et al, 2004; Nicdao et al, 2008). These newcomers’ perceptions, that adequate and appropriate social support had a direct effect on well-being, supplement empirical evidence of this link in other population groups (c.f. Krause and Wulff, 2005). Furthermore, the newcomers in this study linked formal supports (including employment insurance and housing) to health, reflecting the importance of other social determinants of health. Conversely, they also contended that inadequate support had a negative effect on health. The view that deficient social relationships lead to negative psychosocial and physical outcomes (Bloom, 1990; Stewart, 2000) was reinforced in our investigation. Inadequate information support had a negative impact on participants’ use of health and health-related services. Some participants experienced difficulty in understanding the Canadian healthcare system and comprehending the English language used in service settings. These findings complement those of studies in other countries that depict the negative influence of language and cultural distance between providers and immigrants when using health services in the UK (Walls and Sashidharan, 2003) and Australia (Lam and Kavanaugh, 1996). Other research reveals inadequate access for immigrants to culturally appropriate services/supports in the UK (Owens and Randhawa, 2004) and the USA (Salant and Lauderdale, 2003). These barriers prevent equitable access to services, and have a negative impact on newcomers’ health. Insufficient health coverage resulted in under-utilisation of health services, according to the newcomers in this study. Other empirical evidence from Canada attests to the limited use of healthcare services by newcomers due to the financial and cultural inaccessibility of those services (Wu and Schimmele, 2004). Despite its limitations, this study highlights the previously noted need for linguistically and culturally appropriate services in Canada (Neufeld et al, 2002; Wu and Schimmele, 2004) and other newcomer destination countries (Salant and Lauderdale, 2003; Owens and Randhawa, 2004; Warner, 2007). It helps to fill an empirical void by analysing sources and appraisal of support and the influence of culture in the process of settlement across newcomer groups (Leduc and Proulx, 2004; McDonald and Kennedy, 2004), and by investigating the effect of social support on health and utilisation of healthcare services, from the perspective of immigrants and refugees. Most of the studies of services utilisation among immigrants and refugees have been quantitative (e.g. Alegria et al, 2004; Abe-Kim et al, 2007; Nicdao et al, 2008), and do not illustrate personal experiences or the impact of contextual factors on settlement experiences obtained fromqualitative methods. This study adds to the existing literature on immigration and settlement by revealing how service providers and policy influencers can facilitate the integration of newcomers. Service providers’ lack of understanding of the beliefs, practices and perspectives of refugees has been observed but has not been addressed through sensitive support (Stein, 1981; Beiser, 1988; Davis, 2000). The participants in this study proffered policy and practical strategies that would strengthen supports. Newcomers’ participation in policy recommendations is the first step towards an inclusive process that values participatory strategies (Ahmed et al, 2004). The findings can guide the design and testing of intervention strategies (Rich and Ginsburg, 1999) and influence social and political will because policy and programme partners were drawn from ethno-cultural organisations. Another strength of this study lies in the interdisciplinary nature of the research team and its commitment to varied techniques that increased transferability (Nastasi and Schensul, 2005) and reflexivity (Stein, 1981; Malterud, 2001). However, this study depended on cross-sectional narratives concerning relocation experiences that, for some, occurred nine years ago, and are therefore subject to recall and reporting biases. The findings may not be generalisable to other immigrant and refugee populations and other urban or rural centres, due to the effect of culture and contextual factors. Chinese immigrants are a heterogeneous group from varied countries, and varying within-group perceptions may not have been captured. Future research should focus on within-group differences in experiences and perceptions of support needs, and on testing salient support interventions. This type of inquiry should be expanded to include other immigrant and refugee groups, and the implications of newcomers’ views of social support from their preferred services, and their satisfaction with the services received, should be fully explored. Abe-Kim J, Takeuchi DT, Hong S et al (2007) Use of mental health-related services among immigrant and US-born Asian Americans: results from the National Latino and Asian American Study. American Journal of Public Health 97:91Ã¢ÂÂ8. Ahmed SM, Beck B, Maurana CA et al (2004) Overcoming barriers to effective community-based participatory research in US medical schools. Education for Health 17: 141Ã¢ÂÂ51. Alegria M, Takeuchi D, Canino G et al (2004) Considering context, place and culture: the National Latino and Asian American Study. International Journal of Methods in Psychiatric Research 13:208Ã¢ÂÂ20. Balgopal PR (ed) (2000) Social Work Practice with Immigrants and Refugees. New York: Columbia University Press. Beiser M (1988) After the Door Has Been Opened: mental health issues affecting immigrants and refugees in Canada. Report of the Canadian Task Force on Mental Health Issues Affecting Immigrants and Refugees. Ottawa: Health and Welfare Canada. Bloom JR (1990) The relationship of social support and health. Social Science and Medicine 39:635Ã¢ÂÂ7. Citizenship and Immigration Canada (2007) Facts and Figures 2006 Ã¢ÂÂ Immigration Overview: temporary residents. www.cic.gc.ca/english/resources/statistics/facts2006/ temporary/21.asp (accessed 17 September 2008). Citizenship and Immigration Canada (2009) Facts and Figures 2008 Ã¢ÂÂ Immigration Overview: permanent and temporary residents. www.cic.gc.ca/english/pdf/researchstats/ facts2008.pdf (accessed 13 October 2009). Cortes KE (2004) Are refugees different from economic immigrants? Some empirical evidence on the heterogeneity of immigrant groups in the United States. Review of Economics and Statistics 86:465Ã¢ÂÂ80. Creswell J (2003) Research Design: qualitative, quantitative, and mixed methods approaches. Thousand Oaks, CA: Sage Publications. DaviesMMand Bath PA (2001) The maternity information concerns of Somali women in the United Kingdom. Journal of Advanced Nursing 36:237Ã¢ÂÂ45. Davis R (2000) Refugee experiences and Southeast Asian womenÃ¢ÂÂs mental health. Western Journal of Nursing Research 22:144Ã¢ÂÂ68. DeVoretz DJ (1995) A comparison of Canadian and US immigration policy in the twentieth century. In: DeVoretz DJ (ed) Diminishing Returns: the economics of CanadaÃ¢ÂÂs recent immigration policy. Policy Study 24. Toronto: C.D. Howe Institute; Vancouver: Laurier Institution, pp. 31Ã¢ÂÂ 64. Gagnon A (2002) The Responsiveness of the Canadian Health Care System Towards Newcomers. Discussion Paper No. 40. Ottawa: Commission on the Future of Health Care in Canada. Gerrand V (1988) Book review: Refugee Mental Health in Resettlement Countries. International Social Work 31:238. Griffin K (1993) VancouverÃ¢ÂÂs Many Faces: passport to the cultures of a city. Vancouver: Whitecap Books. Hammersley M and Atkinson P (1995) Ethnography: principles in practice, 2nd edn. London: Routledge. HernaÃÂ´ndez-Plaza S, Pozo C and Alonso-Morillejo E (2004) The role of informal social support in needs assessment: proposal and application of a model to assess immigrantsÃ¢ÂÂ needs in the south of Spain. Journal of Community and Applied Social Psychology 14:284Ã¢ÂÂ98. Krause N and Wulff KM (2005) Church-based social ties, a sense of belonging in a congregation, and physical health status. International Journal for the Psychology of Religion 15:73Ã¢ÂÂ93. Lam A and Kavanaugh D (1996) Help seeking by immigrant Indochinese psychiatric patients in Syndey, Australia. Psychiatric Services 47:993Ã¢ÂÂ5. Lather P (1991) Getting Smart: feminist research and pedagogy with/in the postmodern. London: Routledge. Leduc N and Proulx M (2004) Patterns of health services utilization by recent immigrants. Journal of Immigrant Health 6:15Ã¢ÂÂ27. McDonald JT and Kennedy S (2004) Insights into the Ã¢ÂÂhealthy immigrant effectÃ¢ÂÂ: health status and health service use of immigrants to Canada. Social Science and Medicine 59:1613Ã¢ÂÂ27. Malterud K (2001) Qualitative research: standards, challenges, and guidelines. Lancet 358:483Ã¢ÂÂ8. Morse JM and Chung SE (2003) Toward holism: the significance of methodological pluralism. International Journal of Qualitative Methods 2: Article 2. www.ualberta. ca/~iiqm/backissues/2_3final/html/morsechung.html (accessed 28 March 2006). Nastasi BK and Schensul SL (2005) Contributions of qualitative research to the validity of intervention research. Journal of School Psychology 43:177Ã¢ÂÂ95. Neufeld A, Harrison MJ, Stewart MJ et al (2002) Immigrant women: making connections to community resources for support in family caregiving. Qualitative Health Research 12:751Ã¢ÂÂ68. Nicdao EG, Hong S and Takeuchi DT (2008) Social support and the use of mental health services among Asian Americans: results from the national Latino and Asian American study. Research in Sociology of Health Care 26:167Ã¢ÂÂ84. Owens A and Randhawa G (2004) Ã¢ÂÂItÃ¢ÂÂs different from my culture; theyÃ¢ÂÂre very differentÃ¢ÂÂ: providing communitybased, Ã¢ÂÂculturally competentÃ¢ÂÂ palliative care for South Asian people in the UK. Health and Social Care in the Community 12:414Ã¢ÂÂ21. Palinkas LA, Pickwell SM, Brandstein K et al (2003) The journey to wellness: stages of refugee health promotion and disease prevention. Journal of Immigrant Health 5:19Ã¢ÂÂ 28. Raphael D (ed.) (2004) Social Determinants of Health: Canadian perspectives. Toronto: Canadian ScholarsÃ¢ÂÂ Press. Rich M and Ginsburg KR (1999) The reason and rhyme of qualitative research: why, when, and how to use qualitative methods in the study of adolescent health. Journal of Adolescent Health 25:371Ã¢ÂÂ8. Richards TJ and Richards L (2002) QSR Non-Numerical Unstructured Data Indexing Searching and Theorizing [NU*IST], 4th edn. Victoria, Australia: Qualitative Solutions and Research International. Rousseau C, Bekki-Berrada A and Moreau S (2001) Trauma and extended separation from family among Latin American and African refugees in Montreal. Psychiatry 64:40Ã¢ÂÂ59. Salant T and Lauderdale DS (2003) Measuring culture: a critical review of acculturation and health in Asian immigrant populations. Social Science and Medicine 57:71Ã¢ÂÂ 90. Sandelowski M (1995) Sample size in qualitative research. Research in Nursing and Health 18:179Ã¢ÂÂ83. Simich L, BeiserMand Mawani F (2003) Social support and the significance of shared experience in refugee migration and resettlement. Western Journal of Nursing Research 25:872Ã¢ÂÂ91. Statistics Canada (2005) CanadaÃ¢ÂÂs Visible Minority Population in 2017. www.statcan.ca/Daily/English/050322/ d050322b.htm (accessed 22 March 2005). Stein BN (1981) The refugee experience: defining the parameters of a field of study. International Migration Review 15:320Ã¢ÂÂ30. Stewart MJ (ed.) (2000) Chronic Conditions and Caregiving in Canada: social support strategies. Toronto: University of Toronto Press. Stewart M, Anderson J, Beiser M et al (2008) Multicultural meanings of social support among immigrants and refugees. International Migration 46:123Ã¢ÂÂ59. Thoits PA (1995) Stress, coping, and social support processes: where are we? What next? Journal of Health and Social Behavior 35:53Ã¢ÂÂ79. United Nations High Commissioner for Refugees (2004) 2003 Global Refugee Trends. www.unhcr.ch/cgi-bin/texis/ vtx/home/opendoc.pdf?tbl=STATISTICSandid=40d015fb4 (accessed 13 December 2007). Walls P and Sashidharan SP (2003) Real Voices: survey findings from a series of community consultation events involving Black and Minority Ethnic groups in England. London: Department of Health. Warner FR (2007) Social support and distress among QÃ¢ÂÂeqchiÃ¢ÂÂ refugee women in Maya Tecun, Mexico. Medical Anthropology Quarterly 21:193Ã¢ÂÂ217. WorldHealthOrganization (1998)Health Promotion Glossary. Geneva:World Health Organization. Wu Z and Schimmele CM (2004) Immigrant Status and Unmet Health Care Needs in British Columbia. Research on immigration and integration in the metropolis. Working Paper Series No. 04Ã¢ÂÂ18. www.riim.metropolis.net/Virtual Library/2004/WP04Ã¢ÂÂ18.pdf (accessed 3 July 2006).